Some say spring is the most optimistic of seasons. It is the season of activity and opportunity that follows the turbulence of winter. It's the season for entering the fertile fields of life with seed, knowledge, commitment and a determined effort. Horse breeders around the world welcome their foals and in many countries, the show season starts. Israel is no exception. The lush, green mountainous range that separated into lower and upper Galilee and the first crops of springing across Israel are known to be a beautiful sight. When the saplings have matured into trees, the citrus groves will bear fruits soon and wild herbs and edible flowers cover the land with loud bursts of colour. It's the perfect background for the Spring Show of the Israel Arab Horse Society, held in Kabul Village, Alonim. 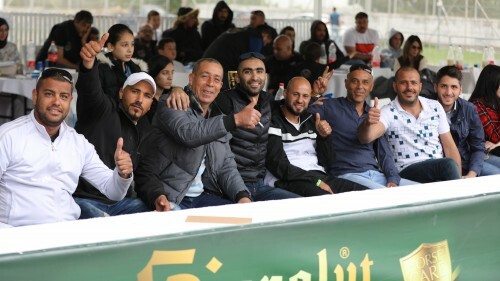 The revamped grandstand war packed with enthusiastic spectators who followed the decisions of the international judge's panel, Mrs. Renata Schibler, Switzerland, Mr. Jerzy Bialobok, Poland, and Mr. Koenraad Detailleur, Belgium. Lots of Israeli breeders took the opportunity and presented their horses to this experienced judges. The Friday started with the yearling and filly classes. Though Dareen HD earned the highest points (92,17) of all yearlings (fillies and colts) the Kais Aldaydaa daughter, bred and owned by Abu Majed Stud, was finally beaten by Warda A.Y. (Fadi Al Shaqab x Aroussa) bred and owned by Yosef Asali, in the Yearling Championship. It was Abel Falah's Justinah RB (Aja Justified x RB Lady Mirage) who took Bronze. Next decision was the Yearling Colt Championship. Gold Champion was Everest (out of Rawiya), another fine offspring by Fadi Al Shaqab, bred and owned by Yunis Mahamud Hasan. Like in the class Yearling Colts A, Assad Al Fawaz (Marwan Al Shaqab x Questurat al Fawaz) came second and took Silver. This colt is bred and owned by Mohsen On Alla. The Bronze Champion was awarded to a colt by Shiraz de Lafon: Janador AH out of Golden Sunset J, bred by AH Arabians and owned by Ali Diab Al Amir Stud. The championship decisions for juniors and seniors have been made on Saturday afternoon, just after a refreshing lunch break. The line up of all the elegant junior fillies was a wonderful sight. The Millenium Star daughter Princess Diamond (out of Marheeva) accomplished Gold. The predominantly Egyptian bred filly was bred by Viki Uzan and is owned by Chen Nof and Noy Uzan. Wadid Al Wadee, bred and owned by Abu Riash Bahaa, took Silver. Her name suggests, she is a daughter of Wadee Al Shaqab and out of Kinuuz. 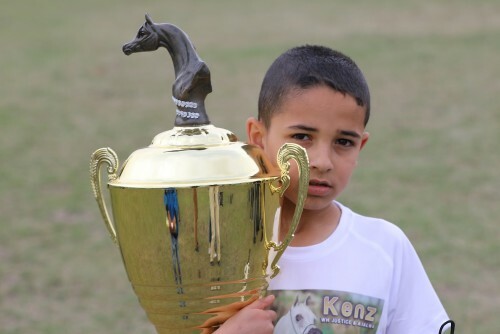 Mahamud Kinan, Al Fayz Stud, is the proud breeder and owner of Bronze winner A'Aisha (Solaz J x Mushrifa Pacha). Major sire lines of modern Arabian horses were present in the Junior Colt Championship. Again Fadi Al Shaqab (Ali Jamaal – Ruminaja Ali sire line) sired a medal winner and this time it was a unanimous decision: Gold Champion Junior Colt was awarded to Qais Al Usool (out of Laila Bint Shaikira), bred by Al Rugey and Al Usool Arabians and owned by Mohamad Qaq. Baha Al Quds (EKS Alihandro x Marhabaa) bred and owned by Tawfik Hammad received Silver, representing the Ruminaja Ali – Nazeer sire line through Marwan Al Shaqab. Bronze was given to TGA Rahees (WH Justice x WC Martini), bred and owned by Tivka Gerad and Kobi Yona, representing the sire line of Nazeer through Padron – Aswan. Gold Champion Senior Mare wowed the crowd and the judges who honoured this mare with amazing 93,50 points in her class. Sired by Laheeb Hala Al Fawaz is out of Zara TDD, linebred to The Minstril and tracing back to the lovely Ana Gayah (Morafic x Fawkia). Onallah Muhsan is the proud owner and breeder of this Straight Egyptian mare. Silver was accomplished by Heelim JFD, bred by Al Awaeil Arabians and owned by Al Hasan Arabians. Her sire is aforementioned Solaz J (representing Padrons Psyche and Marwan Al Shaqab lines) while her dam Al Waad is out of Straight Egyptian lines. Another Solaz J daughter took Bronze, it was Hakaia Ein Al Jamal, bred by Abu Dahash Talaat Feysal and owned by Saada Alhareb. Hakaia's dam is another Straight Egyptian bred mare, Jowhara Al Okab, inbred to The Minstril and the fine Jamil daughter Ansata Justina. Haikaia Ein Al Jamal is the full sister to Gold Champion Senior Stallion Masaoud, owned by Nader Haraz. 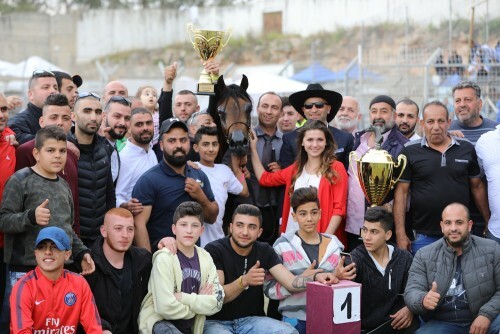 What a grand success for breeder Abu Dahash Talaat Feysal. The Millenium Star (Al Ashkar x WCR Black Diamond), the sire of the Gold Champion Junior Filly, achieved Silver Champion Senior Stallion, bred and owned by Chen Noff and Aviv Bachar. The Bronze Champion El Ajam MP (Al Ayal AA x Sonbolidaa DMF), bred and owned by Michael Peretz, proved that the dam line of famous U.S. National Champion Mare Serenity Sonbolah is still very much alive. It was an impressive show with excellent horses and an exciting atmosphere. Thank you to the organizing team of Israel Arabian Horse Society for arranging everything so elegant and smooth. Arabian Horse Global Network would like to extend our thanks for the excellent collaboration. Now get busy quickly on your springs, your opportunities. Don't just let the seasons pass by. We at Arabian Horse Global Network will take our opportunities, too, and will be back in May when the Israeli Arabian Horse Society’s Galilee Show (4. – 5.May) starts.